Small Medical Sheepskin sections used with a bed pad can add support under the heels and elbows. The Medical Sheepskin Elbow Protector is beneficial with long term patients providing ample protection against Decubitus Ulcer formation, while relieving and comforting pressure sores. Hook-and-loop fastener(s) fasteners on the elbow protector make it easy to put on and take off for patient comfort and convenience. The Medical Sheepskin Elbow Protector fits any size. Best results are obtained when the patient is placed directly on the wool of the sheepskin with no other textile material intervening. This product takes 7 - 10 business days to deliver! I am bed bound. I use this to help prop myself up on my elbow to read. It has helped keep a bedsore away on my elbow. The only downside I have found is that it slips down my arm. I am very happy with this product. I use this to protect my ulnar nerve at night. I am small and was concerned that the product would be too large, but was pleased to find it adjusted down quite far. (It would adjust up as well.) It has two velcro straps, above and below the elbow. My one complaint is that it occasionally slides down off my elbow while I am asleep. Disabled vet in a chair. I use this to help and promote healing of my elbow, which I lean on in my wheelchair. This product provides excellent padding and comfort against that leaning! by Cappy joke from Northern Ca. rolls around up and down. rolls around up and down. rolls around up and down. rolls around, up and down. rolls around, up and down. senior, athletic, workout. senior, athletic, workout. senior, athletic, workout. I use this product to protect my Bursitis elbow while working and relaxing and sleeping. is this 1 or set of 2? 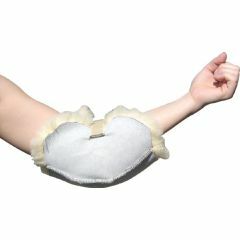 It's one elbow protector, which can be adjusted to fir virtually any size arm. It will work for the right or left arm. I bought one for my grandfather, who is 6' with long arms; the elbow protector fits him just as well as it does me (I am 5'2" and petite) when I tried it on myself first just to make sure it really did not have any rough edges inside.